TALLAHASSEE, Fla. -- Jeb Bush said during Wednesday night's Republican presidential debate that Donald Trump wanted casino gambling in Florida. Donald Trump retorted, "I did not." Trump in the past has boasted that he's influenced elected officials by giving them political donations, and Bush raised the casino issue to make the case that Trump couldn't buy his allegiance. "I promise, if I wanted it, I would have gotten it," Trump claimed, during the exchange. Bush replied, "No way, man." As CNN recently reported, Trump donated to Bush's 1998 gubernatorial campaign while he was actively lobbying to change gambling laws in Florida. The business magnate contributed $50,000 to Bush and also held a $500-a-person fundraiser for him. As it turns out, Trump wanted casino gambling in Florida and failed to get it under Jeb Bush's administration, despite donating money to the state Republican party and to Bush, the Associated Press (AP) and Politico report. "The bottom line is Donald Trump was interested in casino gambling in Florida, I can tell you that for a fact," said former Florida House Speaker John Thrasher, who, according to AP, said he met with Trump twice and talked about the issue, once in New York and once in Trump's Palm Beach Mar-A-Lago resort. Thrasher, now president of Florida State University, said during both meetings Trump pushed for Florida to sign a compact with the Seminole Tribe of Florida to allow casino gambling. At the time, early in Bush's first term, Trump was working with the tribe on a deal to manage what's now the Hard Rock Casino. That deal eventually fell through, but not before Trump pushed Florida leaders to come to an agreement. The stumbling block? Bush. "It was pretty clear Jeb Bush wasn't interested in casino gambling," Thrasher said. When it was pointed out to the Trump campaign that he actually was interested in casinos during the Bush administration, spokeswoman Holly Hicks said by email, "Mr. Trump never asked Jeb Bush personally to approve casino gambling." But "personally" is a technicality. Trump did push for it. News articles across Florida have documented Trump's interest in getting a piece of Florida's gaming industry - from hiring lobbyists to taking a former business partner to court, according to Politico. "If Miami doesn't do casinos, that would be a terrible mistake," Trump told The Miami Herald in 2013. "Taxes would be able to be reduced substantially and Miami is the only place that Las Vegas is really concerned about--in the United States." Former Florida State Sen. Dennis Jones was at Thrasher's second meeting with Trump, along with another state senator, Jim King, and he confirmed Trump wanted to talk about casinos. Jones said Trump also said he wanted to be a player if Florida ever approved destination casino resorts, which Trump is still interested in. "I kind of smiled a little bit when Trump was saying it, that if he wanted it, he would have gotten it. It doesn't work that way in Florida," Jones said. "I don't think Jeb would have allowed it and I don't think the Legislature would have passed it." Trump's on-again-off-again consultant, Roger Stone, told Politico Wednesday night that Trump technically withdrew from his deal with the Seminoles before Bush became governor. Before Bush took office, Trump was making plans for a Miami Beach casino if Florida voters approved a constitutional amendment. They didn't and Trump's plans fell through. "Donald Trump has tried almost every year to have a casino, even before Jeb was governor," said Danny Adkins, president of Mardi Gras Casino in Hallandale Beach to Politico. "It's not even a secret." While Bush was in office The Seminole Tribe wanted to open the Hard Rock Casinos in Hollywood and Tampa and Trump wanted to manage them. Now Trump wants to bring a resort casino to his Trump National Doral golf resort near Miami if lawmakers decide to expand gambling -- an issue that comes up every year in Florida, but which the Republican-dominated Legislature continually rejects. Bush, who served as Florida governor from 1999 to 2007, staunchly opposed casino gambling. The Seminole Tribe did open the Hard Rock Casino in 2004, but it did so with poker rooms, bingo and machines that looked like slot machines but were based on bingo. The tribe wanted real slot machines and card games, such as blackjack and tried negotiating a compact with Bush. After Bush was elected and before he was sworn in, lobbyist Fred Baggett repeatedly tried getting a meeting with Bush to push the compact. "He wanted to meet Jeb directly to discuss casino gambling," said Bobby Martinez, who was the lead lawyer on Bush's transition team. "I knew that Jeb had no interest in introducing casino gambling in Florida and I politely told Fred that I could not and would not arrange a meeting with Jeb." Bush never did agree to expand the games. His successor, then-Gov. Charlie Crist, did sign a compact allowing card games and slot machines, and the casino has become extremely successful. 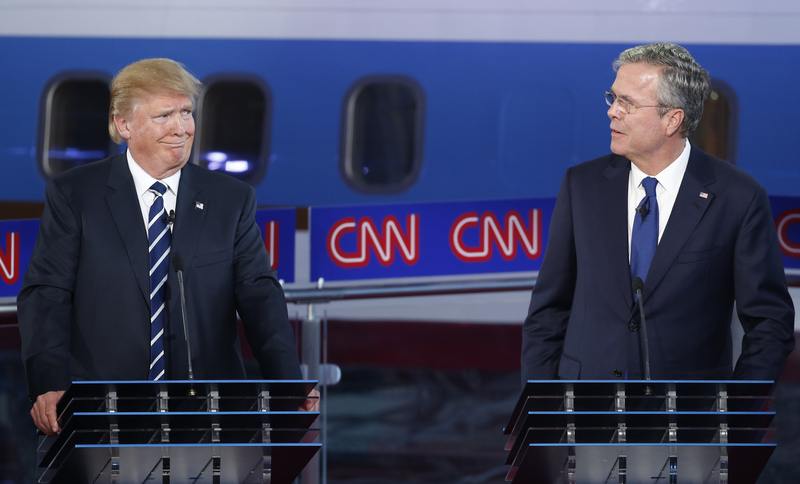 Bush said during the debate that he can't be bought by donors and used Trump as an example. "The one guy that had some special interests that I know of that tried to get me to change my views on something that was generous and gave me money was Donald Trump. He wanted casino gambling in Florida," Bush said. The St. Petersburg Times, published an article on June 18, 1998, with the headline, "Trump supports Indian casinos." In the article, the St. Petersburg Times writes, "Trump has teamed up with the Seminole Tribe of Florida. The two have hired the same high-powered lobbyist to bring full-scale casino gambling to the state." Trump had hired former Florida statehouse speaker Mallory Horne to lobby on gambling issues for him. Lobbyist Brian Ballard, who backs Bush and who represents Trump's business interests in Florida, agreed that if Trump had asked Bush to support casinos, Bush would have said no. "If I represented him then, I would have said, 'Save your money. Jeb Bush is not going to be for destination resorts," Ballard said. The casino dispute comes amid signs that Trump's appeal may be lagging. Politico is also reporting that Trump fever may be dying down. Citing Predictwise, Politico reports Trump's likelihood of winning the nomination has also dipped. According to Politico, mentions of Trump on both television and radio have been trending downward, as well Twitter conversation relative to other candidates.